Mukhtiar Shahani Popular Sindhi Alghoza Been Master. He is most popular Sindhi Alghoza Musical Instrument Player. He sung popular songs Sindhi Kalam in Alghoza. Alghoza is most popular Saaz of Sindh. Mukhtiar Shahani is very expert in his fun of Alghoza Been. He sung Sindhi Kaafi, Sindhi Kalam, and poetry of "Hazrat Shah Abdul Latif Bhitai R.A", and other great poets of Sindh. Alghoza Sindhi Music of spiritual musicians, when we listen it and sweet voice comes to our hearts. Alghoza is most demanded and lot of listeners of Alghoza in Sindh. Mukhtiar Shahani create great name in Sindhi Music. 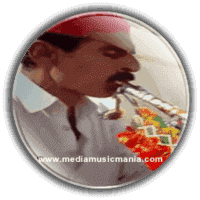 Mukhtiar Shahani started playing Sindhi Alghoza in village culture and feudal society of Sindh, with its rural base, its Autaqs and most important of all as far as the music is concerned, Mehfils. Mukhtiar Shahani grew up surrounded by the sounds of the rural area and took up the study and practice of Sindhi Alghoza at his early age. When he was young, he started to play Alghoza, like Ustad Khamiso Khan, and Akbar Khamiso Khan. Mukhtiar Shahani played Sindhi Kaafi's on Alghoza and he is Master in his Alghoza fun. It is an unforgettable experience and one that can never forget. Mukhtiar Shahani passed a long chapter in Sindh’s cultural history of Alghoza as Sindhi Saaz. I have selected below most popular Alghoza Sindhi Folk Music of Mukhtiar Shahani.